You always thought the park was the only place to boost some air, until you discovered the sweet joy of cliff drops and pillowy powder lines. 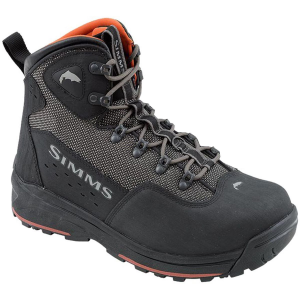 Now you're searching for your thrills in knee deep snow, and you need a ski that can keep up with your playful style when you're far from the park. The Faction Prodigy 3. 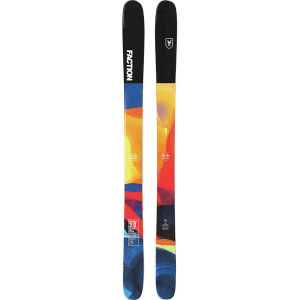 0 Ski just may be the thing for you, thanks to its wider width and freestyle-friendly design. The waist comes in at 104mm, wide enough to help you cut turns when you're off in soft and deep snow, but not so wide that you can't shred the way you want when you're ripping groomers on home. The rockered tip and tail help you get your surf on as you bounce through untouched woods, and when you want to return to your beloved home park the camber underfoot will help you keep stability at speeds. This ski boasts a sandwich construction with a micro-cap design, which means that you've got all the durable benefits of a full sidewall, but with the added durability of a partially wrapped-around topsheet to prevent chipping on both natural and park features. The durable poplar and ash core reduces chatter when hard-packed snow is the only thing to be found, and offers both flex and a solid base when you send big airs. 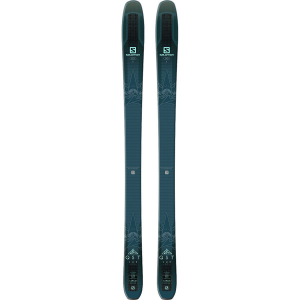 The directional twin-tip lets you ride switch without sacrificing the all-mountain versatility of the ski, and the flax-fiber layers in the core help dampen landings using a more eco-friendly construction.